Dr.Ali Zayni's Dental Center..............Cosmetic Dentistry. ENANA.COM.........The Arab Art Directory Dr.Ali Zayni's Dental Center..............Cosmetic Dentistry. We are trained in the art of using porcelain veneers (porcelain crowns) to completely change a smile. Veneers or laminates (facing with porcelain) can be used to alter the size, shape, color and alignment of your existing teeth. Porcelain Veneers used to treat tetracycline staining. Porcelain Veneers Instead of Orthodontics. 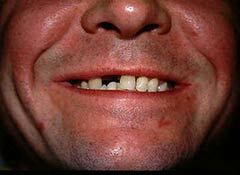 Losing a tooth or teeth in an accident is another common problem that many of us face. The young man pictured below was complaining of some pain in a front tooth. He knew that it was loose and it had been for a long time. After reviewing the X-ray, it was decided to remove the problematic tooth and to place a removable bridge. The space next to the bad tooth has been there for over ten years. He was amazed that we could have given him such a great result in such a short period of time! A very common problems that all adults are facing today is the fact that dentistry has shown them how to keep their gums healthy so that they can keep their teeth for the rest of their lives, what can they do when their teeth begin to wear out on the surface? Well for most people, when the teeth are not sturdy enough to hold a filling larger than what's already in them, the teeth begin to crack and chip and deteriorate. 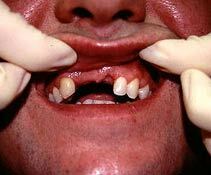 Lock to this young man whose front teeth were breaking down. He decided that he needed to have something more permanent placed on his teeth, so crowns were done. Tetracycline is an antibiotic used to treat a number of illnesses. One of its major drawbacks is that it causes severe staining in teeth if it is used in growing children. 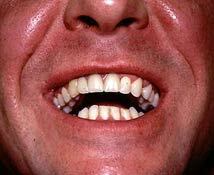 These teeth have a gray or dark brown appearance to them. The discolored teeth usually do not respond to any form of whitening and can be the source of much annoyance in a young man or woman. The picture below shows a typical appearance of what tetracycline staining looks like. 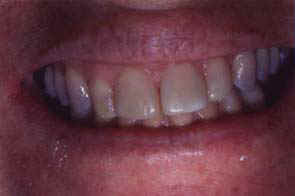 The after picture shows a much improved smile with the discoloration completely eliminated. Total length of treatment was approximately 2 weeks. You can see how dark the teeth are in this view. Also note how the teeth are tilted to one side. This Patient had tried to unsuccessfully bleach her teeth several times. 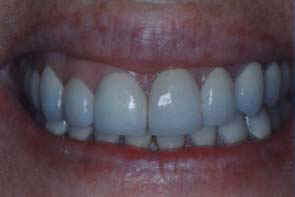 The after picture shows how not only did we improve the color of the teeth but the alignment as well. The patient absolutely loved her new smile. While veneers may not be the answer for everyone, they can be a miraculous cure for those patients who thought that nothing could be done for their teeth. Porcelain veneers are a perfect alternative to braces. With veneers we can correct teeth that are not aligned correctly and have gaps or spaces. Older patients who have always wanted straighter teeth but did not want to undergo years of treatment with braces will love this new technique. Gaps, chips, spaces, crooked teeth can all be corrected in as little as two weeks with veneers. Two weeks after treatment was started, this patient had the teeth he always wanted.